In my most exciting historic podcast, I am on location at the Boston Museum of Fine Arts for the Reveal Ceremony of the famed Paul Revere-Samuel Adams Time Capsule with Dan Sullivan of gemr.com. Plus, a phone interview with the woman who opened the box, Pam Hatchfield, who is Head of Objects Conservation at the MFA. Hatchfield is also president of the American Institute for Conservation. 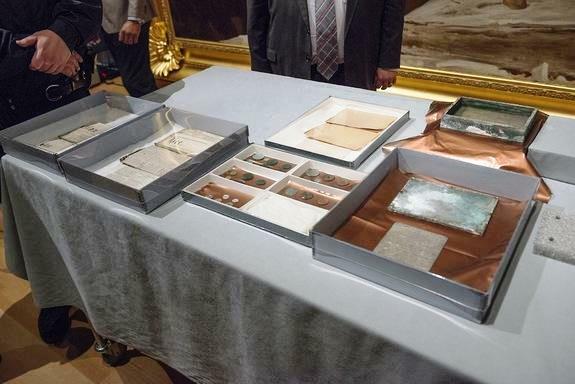 A time capsule was buried in 1795 by then-Massachusetts Gov. Samuel Adams (right), famed patriot Paul Revere (left) and Col. William Scollay. It was opened on Jan. 6 at the Museum of Fine Arts, Boston. The original cowhide capsule was embedded in a cornerstone of the Massachusetts state Capitol then construction began in 1795. In 1855, the contents were shifted to a metal box and reburied. It was dug up in December. Martin Willis’ Antique and Auction Forum podcast features interviews with key players in the antiques and collectibles trade.